2016-10-11: Removed 4.1.7 since player was unstable when sending events between instruments. 2016-08-15: Uploaded a new 32 bit Windows version of 4.0.3. The old version contained some 64 bit files. 2016-07-25: 3.9.9 is unstable, so it has been removed. 2016-07-14: Released 3.9.7 for Mac OS X and Windows. (Changelog). 2016-06-25: Removed the 3.9.4 binaries for Linux. A disk became full when creating the package, and some files were not included. 2016-04-20: Released 3.7.7 for Mac OS X and Windows. (Changelog). 2015-09-13: Released 3.3.6 for Linux and Windows (Changelog). 2015-08-11: Removed 3.3.0 for Windows 32 bit. It didn't work. 2015-05-04: Radium 3 has finally been released. (Changelog). 2015-05-03: Released 3.0.rc22, and added many new screenshots and a video. (Changelog). 2015-04-26: Released 3.0.rc20 for windows. Fixes crash on windows 8 during startup. (Changelog). 2015-04-02: Released 3.0.rc13. Download here. (Changelog). 2015-03-29: Released 3.0.rc12. Download here. (Changelog). 2015-03-15: Released 3.0.rc11. Download here. (Changelog). 2015-03-08: Released 3.0.rc10 for all platforms. Download here. (Changelog). 2015-03-03: Released 3.0.rc9 for all platforms. Download here. (Changelog). 2015-03-01: Released 3.0.rc8 for all platforms. Download here. (Changelog). 2015-02-28: Released 3.0.rc7 for Linux, Mac OS X (beta), and Windows. Download here. (Changelog). 2015-02-20: Released working 3.0.rc6 for Windows. Download here. (Changelog). 2015-02-20: A non-working version of Radium 3.0.rc6 for Windows was unfortunately put up here for about an hour, before it was removed. A working version should be uploaded soon. 2015-02-20: Released 3.0.rc6 for Linux and OSX. Download here. (Changelog). 2015-02-08: Released 3.0.rc5 for Linux and 3.0.rc5-beta for Mac OS X. Download here. (Changelog). 2015-01-27: Released 3.0.rc4 for Linux. Download here. (Changelog). 2015-01-25: Released 3.0.rc3 for Linux. Download here. (Changelog). 2015-01-19: Released 3.0.rc2 binary for Linux. Fix for AMD and Intel CPU's older than Nehalem. Download here. 2015-01-18: Released 3.0.rc1 for Linux (binary versions as well as source code). 2014-08-30: Released 1.9.43 for Linux. 2014-04-21: Released 1.9.42 for Linux. 2014-04-20: Released 1.9.41 for Linux and Windows. 2014-04-19: Released 3.0.beta2 (beta!) for Linux and Windows. 2014-04-15: Released 1.9.38 for Linux and Windows. 2014-04-11: A paper about Radium has been accepted for the Linux Audio Conference 2014. Read the paper here. 2014-04-06: Released 1.9.37 for Linux and Windows. 2014-01-08: Released 1.9.35 for Linux and Windows. 2013-12-07: Released 1.9.34 for Linux and Windows. 2013-11-01: Released 1.9.33 for Linux. 2013-10-05: Released 1.9.32 for Linux. 2013-04-28: Released 1.9.30 for Linux and Windows. 2013-02-05: Released 1.9.29 for Linux. 2012-11-22: Released 1.9.6 for Windows. The new version is almost finished. Contact me if you want to be a beta tester. Screenshot. Implemented undo/redo and saving/loading for audio elements. Audio engine has been debugged and seems solid. The old player thread is not used anymore. All realtime work now happens in the Jack process thread. Radium will probably require Jack both on OSX and Windows. VST instruments are playing fine. 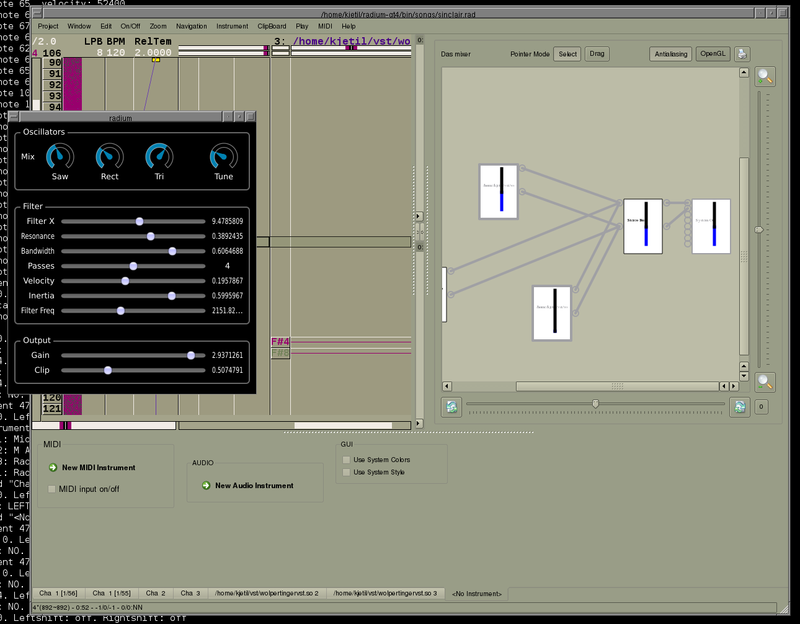 Radium now has a modular audio mixing engine (including a Buzz-like GUI) plus support for soft synths and effects. 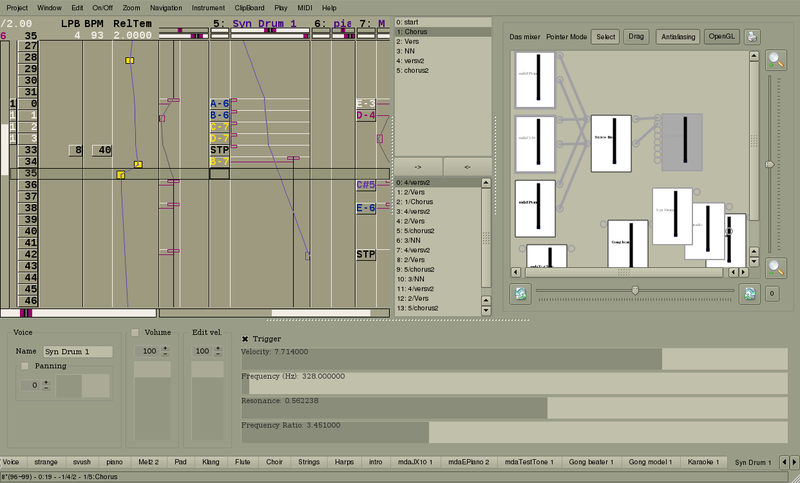 Parameters can of course be automated in the Radium editor. VST/VSTi, LV2, Ladspa and AU should be supported soon. 2012-09-04: Released 0.68.8 for OSX. It's a fix for bad looking colors and font. Download here. 2012-09-03: Released 0.68.6 for OSX and Windows. Download here. 2012-09-01: OSX version is released. Download here. Please let me know if anything doesn't work. 2012-08-28: New screenshot of Radium running in Mac OS X. 2012-08-24: First Windows BETA version is released. Download here. Please let me know if anything doesn't work. 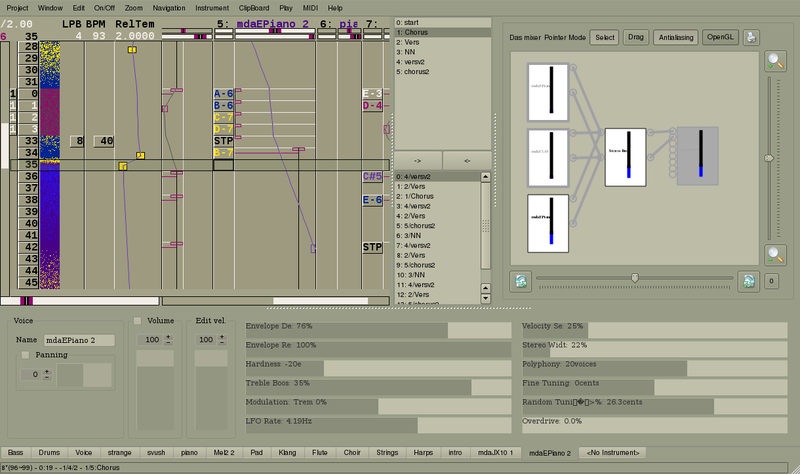 2012-08-23: Uploaded a new Windows screenshot, making sound using a VSTi instrument. 2012-08-16: Radium 0.67.3 is released! 2012-08-14: New screenshot of 0.67.2 running in Windows XP. 2012-08-14: Radium 0.67.2 is released! 2012-08-13: New screenshot of 0.67.0. 2012-08-13: Radium 0.67.1 is released! 2012-08-07: Radium 0.66.1 is released! 2012-08-05: Radium 0.66.0 is released! 2012-07-23: Radium 0.65.11 is released! 2012-07-22: New screenshot of 0.65.10. 2012-07-22: Radium 0.65.10 is released! 2012-07-21: Radium 0.65.9 is released! 2012-07-18: Radium 0.65.8 is released! 2012-07-17: Radium 0.65.7 is released! 2012-07-09: Radium 0.65.5 is released! 2012-07-06: Radium 0.65.4 is released! Contains fix for crash when loading standard midi files. 2012-07-05: Radium 0.65.3 is released! 2012-07-04: Radium 0.65.0 is released! 2012-07-04: New web page! Design by Minimalistic Design.